Custom layout training is 4.5 months course targeted for experienced engineers, BTech, BE, MTech, ME and diploma graduates planning to make career as a layout design engineer in various aspects of layout including analog layout, memory layout, standard cell layout and io layout. 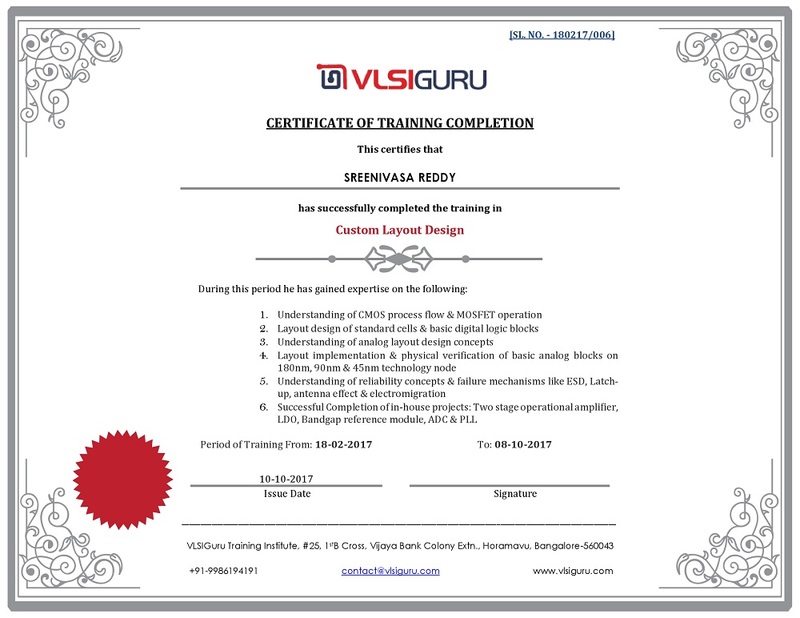 Custom layout design course ensures that a fresher/experienced engineer is prepared on all the essential aspects of Custom layout including ASIC flow, VLSI Design flow, Digital Design concepts, CMOS basics, FinFET basics, various memory architectures, Standard cell, IO’s and detailed analog layout techniques. Course also includes training on UNIX, revision management, scripting and soft skill for effective interview performance. Majority of graduates lack good foundation in digital and analog design concepts, make them under prepared for industry requirements. Custom layout training will enable the candidate for job opportunities within 3 months from the start of course. Complete 4.5 months training ensures that the candidate is an expert in the domain. Course includes 20+ detailed labs & assignments covering all aspects of custom layout with multiple hands on projects. Course starts with detailed sessions on semiconductors, Ohms law, Kirchoff law’s, Diode-operation, MOSFET’s, MOSEFT operations, second order effects, FinFET’s, and detailed fabrication process, which is followed by assignments and hands on projects. Course will also include detailed sessions on layout basics, hands on standard cell layouts, IO layout and memory layout for different architectures. Followed by various analog layout techniques with detailed discussion on Mismatches & Matching, Noises & Coupling, various failure mechanisms which includes Electro migration, IR drop, LOD & Stress effects, WPE, Antenna Effects, Latch up, ESD. Analog layout techniques will involve multiple hands on projects covering various concepts such as common centroid, inter digitation, resistor matching, capacitor matching and opamp circuits, current mirrors, PLL’s, ADC’s, DAC’s, Bandgap, Temperature sensors & Biases -> Current & Voltage bias lines, Large drivers, LNA & Mixers, and Sense amplifier & Bit cell development. Conductor, Semiconductor & Insulators -> Intrinsic & Extrinsic Semiconductor. Basic Passive and Active devices. MOSFET Basics, Operations, few simple circuits & second order effects. FinFET working, Fabrication, advantages & disadvantages. Failure Mechanism : Electro migration, IR drop, LOD & Stress effects, WPE, Antenna Effects, Latch up, ESD (with High voltage rules, EOS effects). Different Types of process – Advantages & Disadvantages – Planar CMOS, FD-SOI, SOI, Bi-CMOS, Gallium Arsenide, Silicon-Germanium, Finfet. Full Chip Construction, Scribe Seal, Pad Frame, Integration and guidelines. IO Layout Guidelines : High speed IOs and High Speed Interfaces. Impact of IR, EM and DFM . Best Practices & Interview Questions.